Alexander, an ordinary, flesh and blood mouse, is not so appreciated by the human family where he lives. Oh, how he wishes he could be like the wind-up toy mouse the family seems to adore. The wind-up mouse tells Alexander of a lizard that can change one animal into another. All Alexander needs to do is find a purple pebble to bring to the lizard. When the family grows tired of the wind-up toy and he is put out with the garbage, Alexander has a decision to make about whether he really wants to be changed. There are multiple theological and moral themes that rise out of this story and make it a good fit for sharing in a worship or religious education setting. In the tale are layers of meaning about valuing and accepting oneself, about helping others, and about the human tendency to discard what no longer holds our attention. Lionni’s writing is well structured and clean and thus can adapt nicely to telling. 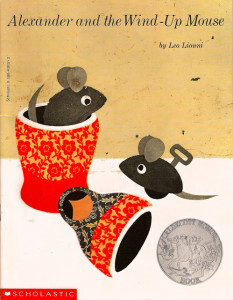 Of course, Leo Lionni’s artwork is as classic as his story and would work wonderfully to read as a picture book. For those interested in Leo Lionni’s creative process, check out his biography on Random House Kids . This four time Caldecott Honor author and illustrator tells it like it is when it comes to writing. This entry was posted in Adaptable for Telling, Picture Book. Bookmark the permalink.